This post probably should have been written forever ago. As big Disney people, my wife and I were excited for the newest fairy tale movie from one of the greatest animation studios of all time. We weren’t able to see it in theatres right away because our son was born around the time it came out, but it was the first movie we went to as soon as our boy was old enough to stay a couple hours with Grandma and Grandpa. Were we disappointed? No. 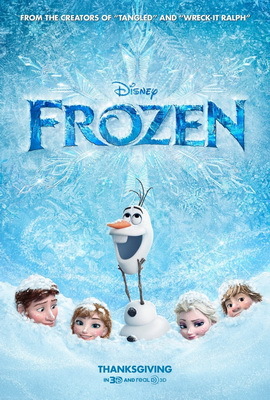 Did we jump on the Frozen bandwagon, proclaiming its virtues for all to hear? Nope. While I enjoyed much about the movie, there are some issues that we had with it. Today, I want to discuss some of the themes we found in Frozen and start a discussion around their significance for those of faith. First, I would like to say that I’m not really sure who the protagonist of this film is. The story generally follows Anna, but Elsa has the more complete character arc. Let’s take a look at both of these ladies and see what connections we can make from them to the eternal story. Anna is a very relatable princess. She is likeable, dorky, and completely devoted to her sister. She has to deal with the hurt of her sister’s rejection, the loneliness after her parents’ death, and her bumpy search for romance. Anna sounds like many young women I know. And throughout, she maintains an optimism that we can learn from in an age of apathetic pessimism. As far as young heroines go, Anna is one of my favourites. Elsa, on the other hand, has a very different set of problems to deal with. Her near-fatal encounter with her sister as a child created a deep-seated fear of herself that her parents were never able to help her with. She grows up fearing emotion and connection, much like other people I’ve known. However, once Elsa’s powers are made known to the public and the people, just as expected, reject her as a monster, she flees to the mountains where she sings “Let It Go,” which currently has over 200 million views on YouTube (just the one video of it. There are several with views in the tens of millions). This is where we find my main issue with the movie. Elsa is different from others. Her difference alienates her from everyone she knows and loves. Her answer is to let go of everything holding her back, including her family, her people, and her responsibilities. She plans to cut everyone out and live by her own rules: “No right, no wrong, no rules for me.” I’ve spoken before about my distaste for such relativistic individualism, and this song epitomizes what I think is wrong with society right now. To be fair, I don’t think the movie agrees with the message of the song. Elsa is shown that she can’t run from her fears, she can’t create her own little world safe from everyone else. She must learn that love is the way to conquer all her fears. However, since “Let it Go,” is such a beautiful, catchy, and self-affirming song, it has been adopted by the general public completely unattached to its context in-story. On the other side, Frozen has one of my favourite definitions of love that I’ve found in any movie. Olaf, the magical snowman, tells Anna that love is about putting someone else’s needs before your own wants and needs. It is, by its very nature, sacrificial. While this may be hinted at in other fairy-tale movies, this is the first time (at least, that I remember) of love being given such an excellent treatment. Our culture currently tells us that love is an emotion, the bubbly, heady feeling you get when you are around “the one.” But the Bible tells us that love is action, not emotion. It is the choice to put others before yourself. Jesus, in John 15:13, tells us that “Greater love has no one than this: to lay down one’s life for one’s friends.” Love is the choice to sacrifice for others. I believe that this is the major theme of the entire film: love as sacrifice. The shallow, instant “love” that Anna feels for Hans at the beginning is shown to be false, and it cost neither of them anything, (however, “Love is an Open Door,” is an amazing song…). The true love that breaks the curse is a sister choosing to die for her beloved sibling: Anna lays down her life in order to save Elsa’s. Even the comedic relief, Olaf, is willing to melt for those he loves. Frozen promotes many things I can get behind. Courage to fight for those we care for. Love as a far more powerful force than fear. The importance of family and friends. Despite some of the storytelling flaws that I think it could have ironed out, the overall thrust of the story is one that I would love my children to adopt. However, despite the popularity of ‘Let it Go” and Queen Elsa in general, I think it is the Princess Anna who really shines as the heroine worth emulating in this story. We could all do with a little more courage, love, and optimism, I think. I like your thematic breakdown. It’s a great musical and a pretty good movie too. Amazing how movies that appeal to kids make so much money. Despicable Me 2 did amazing numbers as well. I think it’s telling that family movies are doing so well. Perhaps our society is waking up from the stupor that too many crude comedies and grotesquely violent films can induce. Thanks for the comment! Some great thoughts here about sacrificial love. You kind of wrote off the song “Love is an Open Door” as shallow, but I think it can be a type that points us to something greater. I examined this on my own blog http://www.theyounganglican.com/love-is-an-open-door-theology-frozen/ and linked to your post to hopefully further discussion. Thanks for chiming in. I will read through your post and comment later tonight. I was going to say I think it’s an Artist’s mind to be able to break down movies like you do (but I think it’s also a “Brandon” mind. ;o) ). I can watch Serendipity and think it’s TOTALLY adorable (and not breakdown how unrealistic it is). I’ll just escape for a couple hours and enjoy the fluff. But I do love that your brain does this…you always bring out fun stuff for me (it’s now a game when I watch movies if I can do this too! Haha). The “Let It Go” part…I actually agree with you on the culture part…but I never thought of it like that in the movie. Maybe because, by the end of the movie – I looked at it as a whole. We know I keep having “vulnerability” come back to me…so maybe that was on my mind. But I thought, “She’s accepting who she is. She’s not going to hide it…even if people judge her, treat her differently, she’s going to stand up for her sister and their love…and be who she was made to be . So seeing your side was interesting. Love your thoughts, as always my friend! I’m so glad you’ve started to watch movies with a discerning eye, I just hope it doesn’t get in the way of enjoying them. We tend to just sit and take in the movie and not dissect it until it’s over. I just have a hard time with “Let it Go,” and I’m not completely sure why. I really just don’t think it fits. There are definitely some solid lines in Fixer Upper.